So Obsessed With has a stylish new look that I legit adore. Seriously, y'all, I cannot say enough about how much I love this new design. I first heard of Designer Blogs when GReadsBooks got a new look, and I bookmarked their site for future reference. Ginger mentioned that she'd gone with one of their pre-made designs that was affordable AND adorable! Well, color me intrigued! I kept dreaming about getting a new look on the blog. Everything you've seen on here until now has been done by myself, and I haven't really loved the looks I've tried out. So, I just kept biding my time and thinking about the day I'd do an official overhaul. While I would have loved to do something custom, I knew that it wasn't practical for me and where I'm at with blogging. I love this place and my readers, but I'm not ready to shell out the big bucks for a custom design. When I started blogging again in December, I began thinking about getting a makeover around here to spruce things up. I ended up just making some changes myself and calling it a day, but I couldn't stop thinking about making this place prettier. 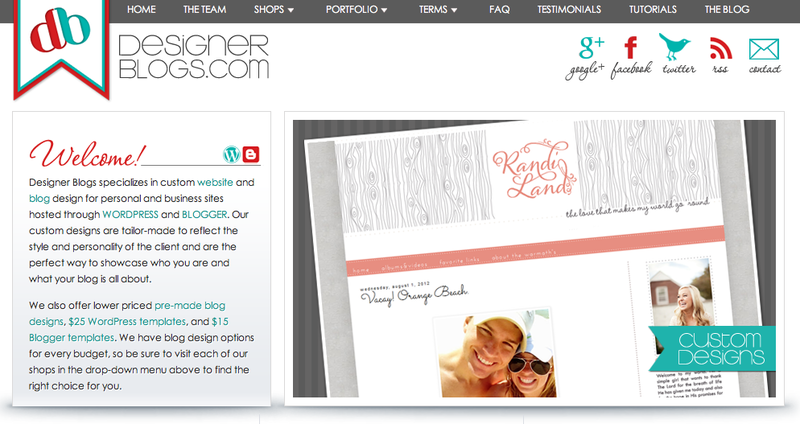 So, I kept searching and checking out design websites... but I always came back to Designer Blogs. I couldn't find anything else that really compared as far as the price and the look. I wanted both! I wanted a design that I loved, that fit me and was something I'd want for a long time, but I wasn't ready for a huge financial investment. A few weeks ago, I decided that I was definitely going to take the plunge. Now I just had to pick a look! I spent a few days debating which pre-made template I wanted to choose, but I knew that I had to go with this one because I kept going back to it again and again. I finally placed my order last week, and my designer, Lindsey, emailed me really quickly. Within a week, she sent me a preview to review. Hello, AMAZING! As soon as I'd looked things over, she went to work and did her thing. And now I'm in love and so happy! I also really appreciated how quickly she answered a few of the questions I had, and I'm so glad she was involved in my blog makeover. I'M SO OBSESSED WITH IT! I love the new design, Hannah! I've actually had Designer Blogs bookmarked for longest time, as well. I'll definitely be going with them when I decide to dish out the money! Very pretty. I love love love the font she used in the button!! I've always thought about doing a blog design but I'm so scared that it'll mess up my actual blog posts because they're all weird and not paragraph-y that I've never taken the plunge. Yours is SO AWESOME. I love it. I would seriously freak out if I had to reformat all of my lists and Three-Things and everything. Imagine my Southern fainting-pose! Cause it would be THAT, very dramatically. Thanks - so do I! Definitely picked this design for that font haha! I love it! Looks absolutely fantastic. Okay, so I tried to comment earlier and I guess it didn't take. LAME. What I tried to say was that this is beautiful, clean, and mellow. I love it! Love it! Especially the header. Love your new design, Hannah! Congrats on it! And, I'm happy for you! Thanks Eszter! Glad you love it too :) I'm definitely happy with it! Hannah, I LOVE IT! It's so fitting for your blog, the perfect look for you, and I'm so glad you found something that looks so great and was so affordable. Congrats! Thank you, Heidi! I wanted to find something that did feel like me & fell in love with this one. So happy you agree! This is so pretty! I loved your old one because the palette was so simple and beautiful. And this one is grey which is just as awesome. Love the header! Your new design is gorgeous! Congrats on your new look - I love it! Love the new design Hannah! I'm waaaaaaay behind in reading through your posts, and my iPad now needs charging (d'oh!) but I'll be back with some more comment love soon. Just wanted to say "Oooooooh, so pretty!!!" Thanks Melissa :) I'm waaaaaayyyy behind on blog reading, too. I got into a blogging funk and decided to loosen up on reading blogs for a bit (just temporarily) because I was stressing so much about it. Thanks for the sweet words about my new look!